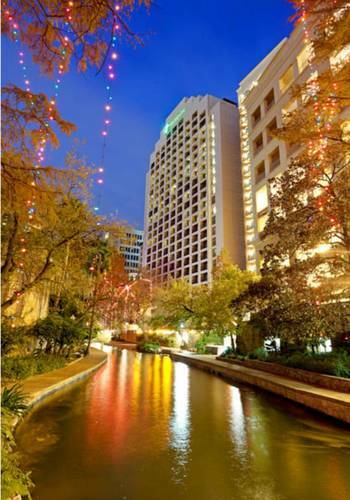 Visit our Newly Remodeled San Antonio River Walk Hotel. Experience the thoroughly modern Holiday Inn San Antonio River Walk fresh from a $13 million renovation. Our hotel boasts all new guest accommodations and public areas with contemporary and inviting d cor. Enjoy a short stroll to the River Walk and youll discover great attractions with unmatched hospitality. Business guests are welcomed to take advantage of free Wi-Fi access, an on-site Business Center and Fitness Center. Stop by Muggs Caf for the all new gourmet Coffee Experience before you begin the days tasks. Stay alert and energetic with a selection of sandwiches, salads and sundry items available 24 hours a day. Nearby is the Henry B Gonzales Convention Center ideal for travelers in town for conferences. Vacationers delight in lively entertainment, rich history and scenic views. Youll appreciate our riverside locale just minutes away from nearby attractions like the historic Alamo, the Rivercenter Mall and El Marcado and The Market Place. Beautiful lodging, comfortable and spacious guest rooms and a conveniently situated location make us a top choice for your next visit to San Antonio. Be sure to try our Windows on the River Restaurant & Lounge for a great dining experience. Come discover what makes this flagship Holiday Inn the premier choice for your stay in San Antonio, Texas. Features the one of a kind "Coffee Experience." Cafe also serves muffins, pastries, sandwiches, salads, fruits, cold beverages, snacks, ice cream and sundries. Hours of operation: 24 hours a day, seven days a week. Children's program - Pool, whirlpool. Hotel is on the Riverwalk, one block from Children's Museum, and three blocks from the Alamo. Nearby attractions include Charlene McComb's Empire and Majestic Theaters with seasonal performances. just 6 blocks from the main entrance. Located just 3 blocks from the world-famous Alamo. This is the historic site where one of the most important battles in the fight for Texas' independance was fought. SeaWorld is located just a short 20 minute drive from the hotel.